Mini Red (ages 4-8) soft balls, smaller rackets, mini nets, smaller courts, a fun way to introduce young people into tennis with fully qualified coaches. Mini Orange (8-10 Years), low compression balls, played on a 3/4 court with fully qualified coaches. Mini Green & Juniors (10-17 Years), full ball played on a full court with fully qualified coaches. Adult Challenge Night (17+) – social tennis, singles/doubles matches, for all abilities, make new friends/meet new players, followed by snacks and drinks in the cafe area. BBQ Nights during the summer. Junior Challenge Night (ages 12-17) – social and fun tennis games for juniors players, matches against each other, doubles/singles, meet new players/friends. The new youth club facilities will also be available from March 2018. Mini Red (ages 4-8) soft balls, smaller rackets, mini nets, smaller courts, fun introduction to tennis. Mini Orange (ages 8-11) low compression balls, orange on three-quarter court, green on full court, played on full size nets. Mini Green / Juniors (ages 12-17) coaching technical and tactical elements of the game. Stay & Play Tennis for families, children and young people from 2-3pm – these sessions are free thanks to support from the charitable trusts. Adult Coaching Session – anyone wanting to improve their game with coaching staff on hand to help you do just that! You do not have to be a member to take part just turn up and book by the calling the team. 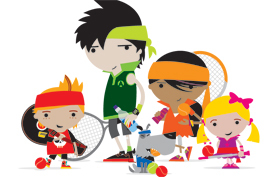 Stay & Play Tennis is for families, children and young people wanting to spend quality time together, with the chance to take part in sporting activities. Sessions take place Saturday’s 2-3pm and Sunday 10-11am. Refreshments and fruit are provided with coach-led sessions, totally FREE. Book today or just turn-up, great opportunity to try something new! PRIVATE LESSONS – are available from £10.00 – please contact the Coaching Team for further details.